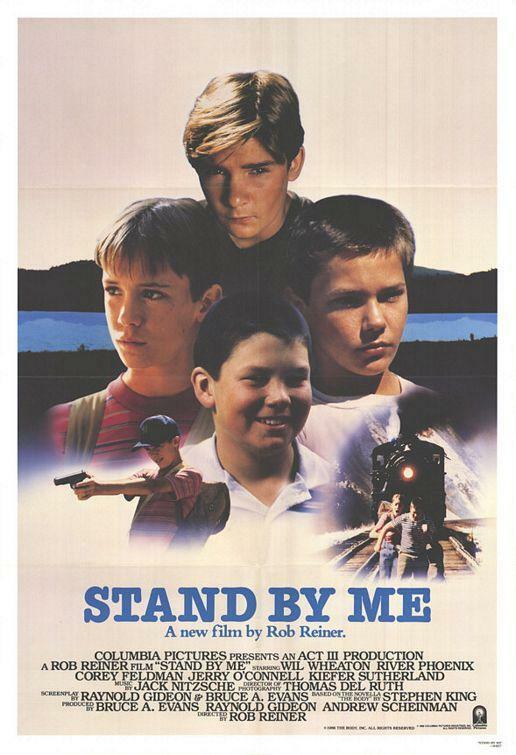 Based on the Stephen King novella The Body and reportedly being the first film adaptation of King’s work that he fully approved of, Rob Reiner’s adaptation, Stand By Me (renamed due to the producers apparently thinking people would think the novella’s original sounded a little too dark or even perverse) is one of those quintessential “coming of age” films – indeed it may be the coming of age film. So much so that watching it for the first time these days after nearly three decades of imitators may take a little bit of adjusted expectations – you may have seen this done elsewhere. 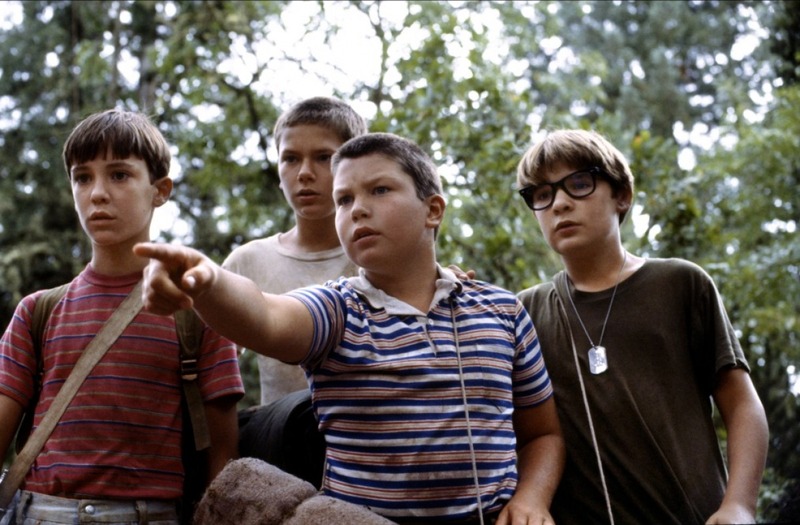 Stand by Me sets itself apart, however, with emotional honesty and engaging performances on the part of its four young leads. Set in the late summer of 1959 in a town called Castle Rock, Maine, the film follows Gordie Lachance and his friends Chris Chambers, Vern Tessio, and Teddy Duchamp as they journey outside their hometown to locate the body of Ray Brower, a boy who has gone missing and whose body is rumored to be lying somewhere at the side of the train tracks where he was struck and killed. The boys hope to bring the body back to town and become local heroes for finally allowing Ray’s family the opportunity to lay their boy to rest. Naturally, as is the standard for these types of films, personal issues and conflicts rise up over the course of their journey from their tree house and into the wilderness. Gordie, an aspiring writer, is living in the aftermath of his supportive older brother’s death, a dark place where his parents barely pay attention to him out of grief, except for when his father decides to berate him for not being more like his deceased brother. Chris, the tough but sensitive type, comes from a family with a bad reputation for breeding hooligans and whose older brother, “Eyeball,” does nothing to rebuff the accusations. Chris is Gordie’s best friend, who now works as a sort of surrogate to Gordie’s brother, and Gordie, in turn, encourages Chris to stick it to those who expect the worst from him and who won’t give him a chance, encouraging him to join in the college prep courses he’ll be attending later on. These two form the backbone of the story in Stand by Me, but there’s also Vern, the source of the rumor and the sort of awkward, fat kid who stands as both the comic relief in the film and also as the sort of tragically friendly person who’s most likely to let people push him down if it meant that he could hang around them and feel like part of the gang, and then there’s Teddy, whose obsession with daredevil antics, war, and defending his father’s honor seems sort of misguided, given that his father, a World War II veteran, was committed due to PTSD and who once nearly killed Teddy, permanently scarring his ear after holding him so close to a burner. For each of the boys, bringing back Ray’s body, in their eyes, means that each of them will achieve a sort of redemption in the eyes of others. 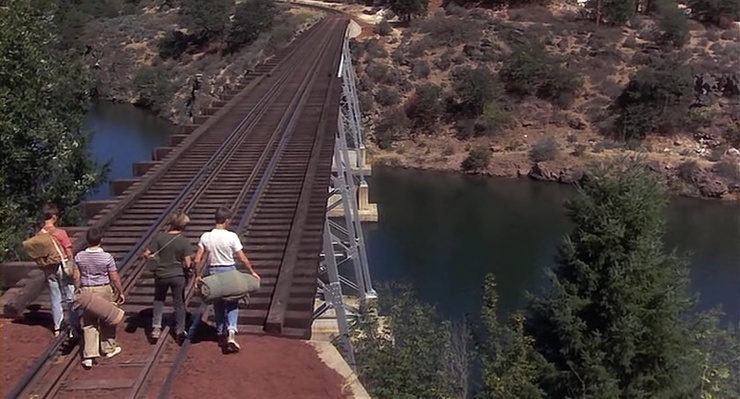 Stand by Me works because it captures a sort of timeless, youthful spirit that, yes, can at times feel kind of mawkish, but is also recognizable to almost anyone who can remember their early adolescence. I was a military brat who constantly moved, and yet there were areas of each of the boys’ lives where I could pick something I could identify with, whether it was the depreciation of a certain skill, the abusive father, the teasing about my looks and awkwardness, or even, at times, having a sort of notorious reputation (though not one so criminal as Chris and his family’s). The boys’ journey to locate Ray’s dead body also encapsulates the present and future struggles that they will have to work through – they’re given this journey, but for what? To serve a boss? To wait until the inevitable end? To use their God-given gifts to make the world a better place? The older teens, to whom the story periodically cuts to, stand in for the cutthroat oppression that they will undoubtedly continue to follow them through for the rest of their lives as well as the potential ugliness that age will bring, and they will either persevere through it, over and over again, or are inevitably ended by it, whether it be gradually or suddenly, like an oncoming train. The film is profound in the sad emotional depths that it’s willing to explore as these boys start taking their first steps into manhood, but it’s also optimistic that those relationships may also have a positive influence on them, too. 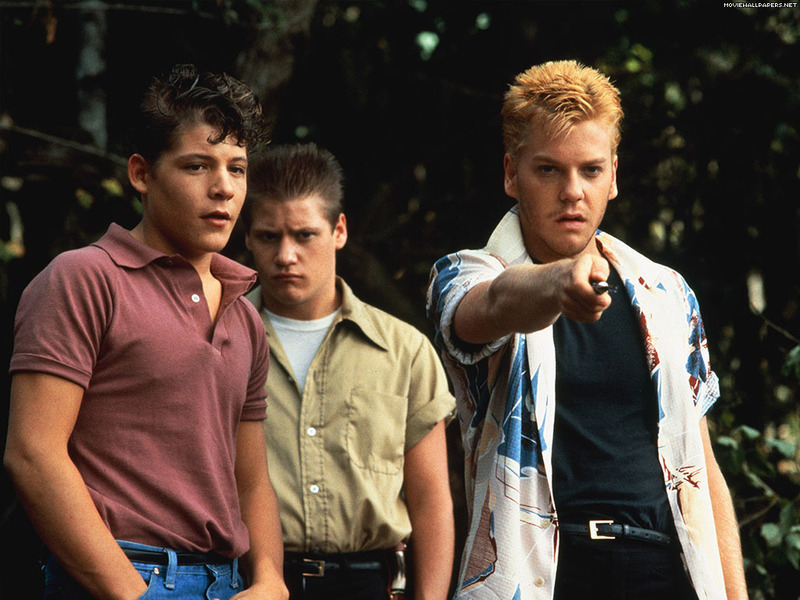 It was a stroke of luck that the filmmakers were able to cast such talented young actors in each of the roles that could carry the weight of both the highs and lows that the story threw at them – the late River Phoenix in particular brings a touching vulnerability as the otherwise tough-acting Chris, but Wil Wheaton is also quite good as the quietly tormented, Gordie (also played by Richard Dreyfus as the narrator, looking back on his youth), and Corey Feldman and Jerry O’Connell, too, are excellent in the supporting roles of hothead Teddy and awkward Vern, respectively. It cannot be easy playing realistic children so emotionally vulnerable without the audience feeling like they’re just being manipulated by the filmmakers with false emotion. But the film is also a tribute to those types of friends who, even if they don’t exactly fully know what you are going through, know exactly when to be there by your side and push you through to the end, which is probably why the decision to rename the film is so appropriate. It’s a bittersweet story, one that acknowledges the inevitable ugliness that will often come our way, but it also celebrates those relationships, whether they be just for a short time or not, that help us get through those tough times and often become more important to us than any defeat we may face — sometimes making us better people as they push us through to the other side. 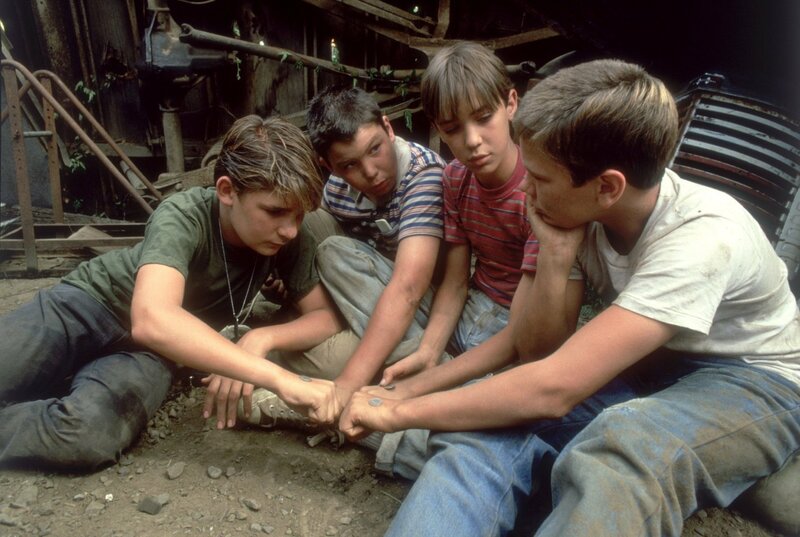 It may seem kind of schmaltzy at times (even with the hilariously over-the-top vulgarities use throughout), but Stand by Me has deservedly become a classic (if not the classic) coming-of-age film.